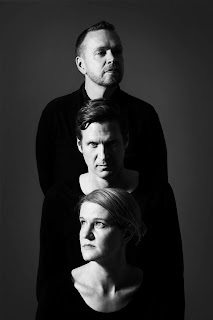 Sweden's Red Sleeping Beauty took a long hiatus between the '90s and their 2016 release Kristina, but they are back to address unfinished business. And to our ears, that business appears to be proving that they are one of the world's top synth pop acts. The proof will come with the band's fourth album, which still is in production, but we get a tease of what is to come with today's Always On Your Side EP. The title track, which will be on the upcoming album, already is one of my favorite songs of the year. The following "Falling Out Of Love" is from a demo by Niklas Angergard's other project, Acid House Kings. "Just For Fun" is a cover of a top Alpaca Sports' song. The closer is "Tonight, Tonight, Tonight", an unabashed love song. This is synth pop the way it should be -- playful (dig the intro to "Falling Out Of Love" and the low tones punctuating the chorus on "Just For Fun"), sunny, uplifting and pristine in tone. Yes, Always On Your Side is a Nordic gem of the highest order. Red Sleeping Beauty are Niklas Angergard, Mikael Matsson, and Kristina Borg. The EP is out today on all digital platforms, and a CD is available via Sunday Records.